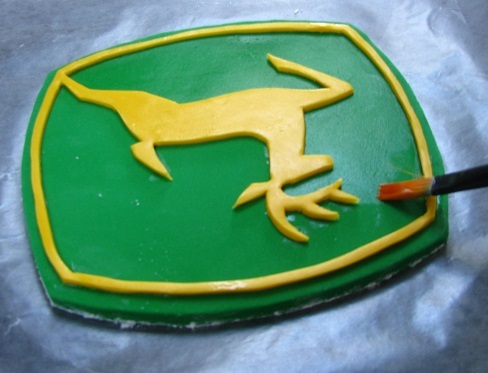 Beginning the second day of decorating the John Deere cake, measure out enough gum paste for the letters for the name you'll be placing on the cake. Color the gum paste Kelly Green to match the logo decoration. Knead well and ensure all of the color is evenly mixed into the gum paste. Dust workspace with cornstarch and roll gum paste as thin as possible without tearing. Press the Tappits letter cutter into the gum paste to cut out the letter. Press down on the letter, then wiggle back and forth to loosen it from the rest of the gum paste. Firmly rat-a-tat-tat the Tappits cutter on the edge of a counter or table to loosen the gum paste letter. Just a word of caution: any letters with really skinny parts are very difficult to remove without tearing and may take several tries to get one whole letter. And of the letters I did, I must say that the Tappits letter "N" is of the devil! It took me a solid 40 minutes to get just one complete letter N! And fortunately the name I was doing only had one "N". I think the gum paste started to dry a bit when I reached the 40 minute mark, and that's what helped that "N" come out of the cutter in one piece. Place gum paste letters on wax paper and set aside. While the gum paste letters are drying a bit, mix and bake the cakes needed according to the recipe's directions. Once cakes are done baking and have cooled in their pans, run a knife around the inside edge of the pan to separate the cake from the pan. Use whatever method you're comfortable with to loosen the cake from the pan. Or here is the method I use: To loosen the cake from the pan, place the cake pan up on its end, place a butter knife between the cake and the inside edge of the cake pan, and very gently press the knife down onto the side of the cake and lightly pull the cake the toward you. Do this a little at a time around the entire edge of the cake until the cake feels like it will easily come out of the pan. This method took a few tries to master, but it's the only way I remove my cakes now. 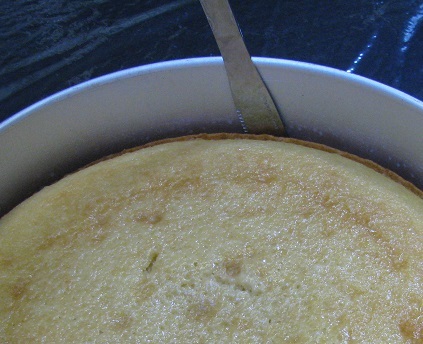 To remove the cake from the pan, place a large dinner plate over the opening of the cake pan. Next, holding the plate tightly to the cake pan, quickly flip the pan and plate over so that the pan is now on top of the plate and the cake should fall onto the plate. (This method only works if the cake is completely loose in the pan. Otherwise the cake may fall to pieces.). Lift the cake pan off the plate and it will reveal the underside of your cake. You can see the mark where my butter paper square was ;). To learn about using a butter paper square to help release your cake, check out my Velvety Chocolate Cake recipe. Wrap all of your cakes in clear plastic wrap. Ensure they are wrapped well enough so no air can dry out the cake. Set cakes aside and allow to rest overnight. They will be frosted and filled the next day (the day before delivery). 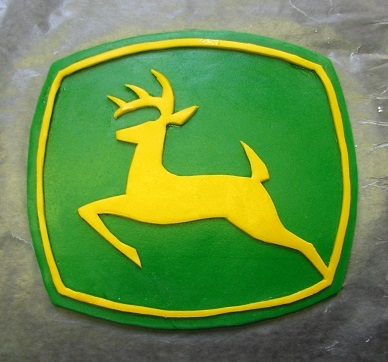 Now, moving on to finish the John Deere logo. Lightly grease the back of the paper cutout with Crisco shortening to help it stick to the surface of the fondant/gum paste mixture. Using the rolled yellow fondant/gum paste mixture from the day before, lay the logo greased side down on the yellow fondant/gum paste. 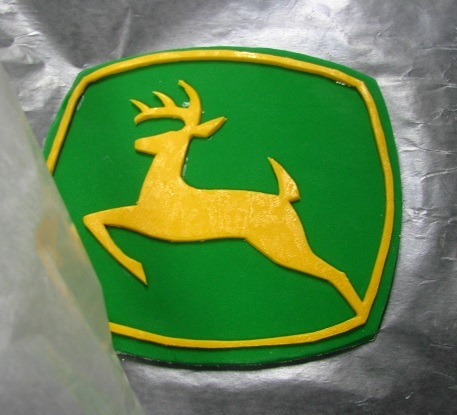 Using an X-acto knife, gently trace around the entire logo being careful not to tear or stretch the fondant/gum paste. Gently peel away the paper logo to reveal the logo cutout. In small sections at a time, cut away and remove excess pieces until just the logo remains. Once all of the excess pieces are removed, use the edge of your ruler to gently straighten the sides of the logo, if needed. Next, cut out a piece of wax paper slightly larger than the logo and lightly grease with shortening. Cut the wax paper around the logo cutout to remove it. Now, take the greased wax paper piece and lay it greased side down on top of your logo. Flip your wax paper/logo sandwich over so you see the back side of your logo. Peel the wax paper off of the back of your logo. Get the green background piece of your logo ready, because we are about to glue the yellow and green pieces together. Brush a small amount of homemade edible adhesive (50% water, 50% corn syrup mixture) onto the back of the yellow logo piece. Be sure to put enough so every part of the back piece is covered. Next, grab the wax paper holding the yellow logo piece by its edges and carefully flip it over and hold it over the green background. Line it up as best as you can and gently lay the yellow logo over the green background. Using light pressure, trace your fingers over the yellow logo piece to ensure it adheres well to the background. Peel back the wax paper to reveal the logo! Yay! Almost done! To give your logo a cleaner look, dab a dry soft-bristled paintbrush in a little Crisco shortening and in a small circular motion, spread a light amount of shortening evenly over the entire front and sides of the logo. Now your logo is complete!! Set logo aside for the last day of decorating.